Modified plate from "Insects of Australia" showing a few stick insect eggs thought to resemble plant seeds. Entomologists don’t observe this sight very often. 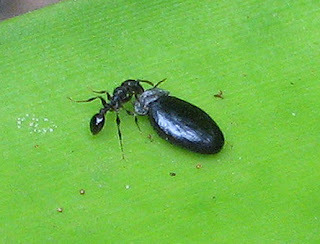 It’s a small ant attacking what appears to be a seed. Some ants harvest seeds for various reasons. Some harvest grass seeds for food others harvest acacia and other seeds for the elaiosomes (oily, nutritious bodies) that they bear. This is called myrmecochory or co-evolved mutualism between ants and plants. Over 1500 species of Australian plants have been shown to be myrmecochorous. Myrmecochorous (A new word for your next Scrabble game!) plants bear bodies that aid in the dispersal of the seeds. In this example I found what looked like a seed bearing an elaiosome. Elaiosomes attract some ants and they harvest the seeds just for the elaiosome. In so doing they carry the seeds to their nests and remove the elaiosome and then either leave the seeds in the nest or take them away for disposal. This seems to be a phenomenon more common in Australia than elsewhere. Seeds bearing elaiosomes are usually tough and are not themselves damaged by the ants, but they may be scarified during the ants’ snipping process. This plus the “protection” afforded the seeds in the ant nest may contribute to the germination of the seeds. Although of biological interest, this photo is of more interest to me than meets the eye. You see, the eggs of many stick insects are thought to resemble plant seeds with elaiosomes. At first, I thought I may have made a direct observation of an ant harvesting a stick insect egg. But further examination revealed that it was, in fact, an acacia seed from an adjacent tree and not a stick insect egg. 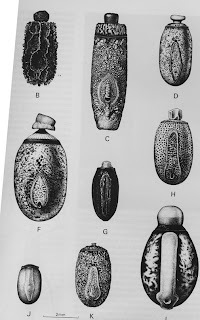 The modified plate from the textbook “Insects of Australia” shows a group of stick insect eggs (species distinctive in morphology) and their caps or opercula. These opercula are thought to resemble elaiosomes of seeds. It is thought that ants can be deceived by the eggs’ resemblance to seeds and take them to their nests. This serves as a form of dispersal for the stick insect eggs, thereby serving to move the stick species to different habitats. This may afford a degree of protection for the stick eggs from parasites and predators. It may be relevant that some stick species mimic ants in appearance and behaviour in the first instar stage. This may help them to escape their hosts once the eggs hatch. For more information on myrmecochory see chapter 3 of the "Insects of Australia". 1991. The Insects of Australia. A textbook for students and research workers Vol. 1. Melbourne University Press, Carlton, Vic. Pp 1-542. Here is an array of moths all collected at the same light sheet in the rainforest over a few months time. They all bear similar colour patterns but are from a number of families. We see the following families in the photo above: Pyralidae, Oecophoridae, Tineidae, Tortricidae, Arctiidae and Cosmopterigidae. Ted Edwards points out that other families with some species with similar yellow/brown colour patterns are: Xyloryctidae, Lacturidae, Noctuidae, Psychidae, Heliodinidae, Lecithoceridae, Gelechiidae, Hypertrophidae and Adelidae. He further notes that one theme is present in these moths is that they are all small. No similar colour patterns have been found in moths of the families noted that have large species such as the Noctuidae (cutworms), Pyralidae or Arctiidae. This yellow/brown motif is clearly a form of convergence. Convergence occurs when unrelated organisms independently acquire similar characteristics. This suggests that there must be some advantage to looking like this. But what is it? It is obviously a form of disruptive coloration. Simple disruptive coloration is defined as a visual disruption forming a pattern that does not coincide with the contour and outline of the individual. But the patterns of these different moths are slightly different one to another. Could the brown and yellow look like a sun spot on a leaf? Or could it serve to camouflage the moth on a tree trunk or a piece of bark by disrupting the wing shape? I can’t answer these questions because as often as I have seen these moths at the light sheet, I’ve not seen a one of them during the day in their natural habitat. Perhaps, an Honors or a Masters project is beckoning….. The Barron River Falls in Kuranda. Giant Petaltail Petalura ingentissima Tillyard. In the three days from 7-9 Jan. 2008 we had over 700 mm of rain here on Butler Drive. 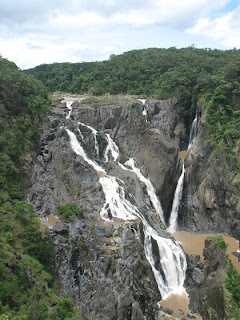 Locals know when there is that much rain, it is worth having a look at the Barron Falls for a real aquatic spectacle. Well, as luck would have it, we waited a bit too long and the show was nearly over on Sunday, the 13th when we went to the falls. But it was lucky 13 because as we were looking Australia’s largest dragonfly the Giant Petaltail Petalura pulcherrima Tillyard or, perhaps, P. ingentissima (family Petaluridae) landed just in front of me and posed for a shot. This was my first sighting of this monster species. (There is some difference of opinion as to whether two species are involved. See reference below.) The wingspread is over 16 cm (that’s over 6 inches). This species occurs along the coast in the northern tropics. The individual stayed stayed for a few seconds and then glided away. Theisinger, G., Hawking, J. 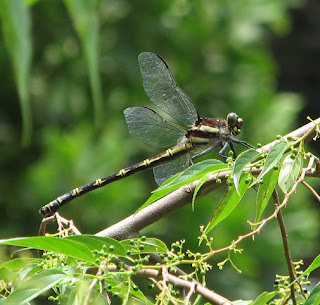 The Complete Field Guide to Dragonflies of Australia. 2006. Pp 1-366.CSIRO publishing, Collingwood, Vic. Nymph of Nanophyllium pygmaeum Redtenbacher. Note colour and shape. Nanophyllium pygmaeumRedtenbacher--Adult. The same individual as above. Quite a change! Leaf Insects (family Phylliidae) are among the best examples of camouflage. They range in size from about 3 cm to some real giants 11 cm or more. They are not uncommon in the Old World tropics in places like Malaysia and Thailand. But they are oddities in Australia where only two species are reliably known and one is not really very leaf-like. They are unknown in nature in the New World. Leaf insects are closely related to stick insects (walking sticks for those in North America). In fact, they were considered in the same family until recently when the group has gotten some real taxonomic overhauls from a number of enthusiasts. Stick and Leaf insects are very popular pets in many countries, especially those in the northern hemisphere where they are commonly sold in pet shops because they are relatively easy to keep, have interesting habits and don’t require much space. There is even a Society of amateurs and professionals called the Phasmid Study Group. You can find a wealth of information on Stick and Leaf insects from all over the world and how to keep, breed and maintain them in culture. You will be surprised at the activities of this group and how much has been learned about the biology of these insects just by keeping them alive and watching them in captivity. But I digress. Of the Phylliidae known from Australia, Phyllium monteithi Brock & Hasenpusch was described only in 2002. It is known from only a handful of specimens. Described from Mt Lewis, Queensland, it was not too surprising to find it here in Kuranda which is not that far away from Mt Lewis as the crow flies. Males are attracted from time to time to the “black light” and sheet. They are always on the move and don’t stay long. They seem to be forever attempting to move upwards, a habit that indicates a tree-top existence. In captivity, they always seek the top of the container. Females have never been seen here. It is assumed that they don’t fly and remain well off the ground in the tree-tops. A number of other species have been kept in captivity for a number of generations but they are considered difficult and a real challenge for the hobbyist. Nanophyllium was a different situation altogether. It was found in the Iron Range of far North Queensland while on a fieldtrip with CSIRO in 1986. I was beating low-growing vegetation in the rainforest one morning and a small green nymph fell into the net. With some excitement I determined it was a Leaf Insect but very small. It was living in a small, isolated sapling under a dense canopy of larger trees. I gently placed it into a container for transport back to Canberra to rear to maturity. We stayed in the area for almost two weeks and that was the only example that we found. The nymph was kept alive offering it a variety of shrubs to eat and it was discovered it preferred Pyracantha , an introduced ornamental shrub. All the time I expected that I was raising a Phyllium species. So it was with some excitement and perplexity to discover that it wasn’t a Phyllium at all. That was not the entire story but just the beginning. What appeared to be a stout, flat leaf insect, developed into an elongate, wasp-like insect. But what was it? A check of an old tome by the Austrian entomologist Josef Redtenbacher published in 1907 revealed that I had found a member of a small genus and species originally described from Katau, New Guinea, Nanophyllium pygmaeum Redtenbacher. A check of various Australian collections revealed that Geoff Monteith had collected some nymphs of the species from the Iron Range in 1976 but they were not identified as such. But that was not the real interest of the discovery. The two photos shown here of the species are of the same individual. As a nymph it was greenish and flat and had very short bead-like antennae. It had all the appearances of a female leaf insect. It moulted several times, each time getting a little larger and consuming its skin after each ecolsion. But with the final moult came the big surprise. 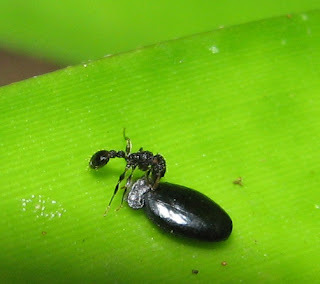 The nymph changed from being flat and leaf-like to elongate and black with very long antennae and behaving in a wasp-like fashion. It was continually on the move flying and attempting to always move upwards. It lived about 27 days before it died. Mr T. James of the Phasmid Study Group informed me at the time that Phyllium leaf insects produce non-adhesive eggs that are randomly broadcast by females. I guess they land on the ground and when they hatch the nymphs seek to ascend trees as do other sticks. My specimen selected the wrong tree! Not only was I to find it but it was a small tree isolated from others and it seemed doomed there unable to ascend into the canopy. This is still the only known adult of the species from Australia, probably because few people with the interest ever collect in the Iron Range. Iron Range is well known to biologists because it harbors a number of plants and animals that are found nowhere else in Australia. Many are shared with New Guinea and others are just plainly unique to the area. This was formally presented in the entomological literature in Rentz (1988). A third species was recorded in the literature as late as 2002 by Brock & Hasenpusch. It is Chitoniscus lobiventris (Blanchard). There is a record in the Cambridge Museum of Zoology labeled August, 1903 and collected in Cairns. This could possibly be mislabeled because the species is otherwise known from the Solomon Islands. But with the situation described above, the record could be authentic so we are still looking! Thanks to Paul Brock for comments. Brock, P., Hasenpusch, J. 2002. Studies of leaf insects (Phasmatodea: Phylliidae) in Australia. Journal of Orthoptera Research, 11: 199-205. Rentz, DCF 1988. Nanophyllium pygmaeum Redtenbacher (Phasmatodea: Phyllidae: Phylliinae), a leaf insect recently recognized in Australia. Australian Entomological Magazine, 15: 3-5. Asilid with scarab beetle prey at night. Asilid with pyralid moth prey at night. Robber Flies (family Asilidae) are well known to all entomologists. More than 7000 species are known from almost all continents and habitats. They are very distinctive in gestalt and range in size from 5 mm or so to some real giants at over 40 mm. Many mimic other insects are frequently found on flowers where they ambush unsuspecting prey. They are hairy and have long, strong legs suitable for catching and holding prey. Their large eyes and the concave groove between them serve to distinguish the family from others that look similar. There are a number of websites that deal with Robber flies with many providing excellent photos. 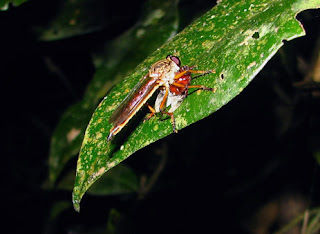 For a couple of years I have encountered Robber Flies at night while wandering around the rainforest. At time they were with prey. I wondered if they were nocturnal but thought they might just be stirred into action by the light of my torch or, perhaps, by moonlight. 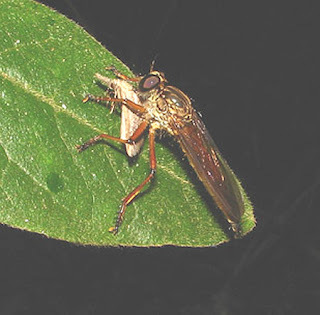 But on the night of 12 December 2007 while walking around Lake Barrine, north Queensland with Darryl Gwynne, multiple encounters with robber flies with prey were observed. We were deep within the forest and the moon was in its crescent phase, so there was virtually no ambient light. Consultation with several Robber Fly aficionados suggests that nocturnal behaviour is unknown in this group. In fact, Wood (1981) suggests that they are seldom found deep in the woods and are active in bright sunlight. Sure, some are always attracted to lights at night. The lights are assumed to “wake” resting flies in the immediate vicinity and attract them. But this could not have been the explanation on the night we made our observations. Of the dozen or so sightings, all had captured nocturnal insects further suggesting they were on the prowl in the dark. Once the species illustrated is identified, I’ll add that to the blog as well as any future observations. Wood, G.C. (1981): Asilidae. - In: McAlpine, J.F. & Peterson, B.V. & Shewell, G.E. & Teskey, H.J. & Vockeroth, J.R. & Wood, D.M. (Eds. ): Manual of Nearctic Diptera. Volume 1. - Research Branch, Agriculture Canada, Monographs 27: 549-573; Ottawa.